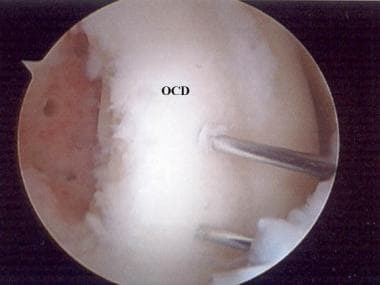 Osteochondritis dissecans (OCD), by definition, is a disorder of one or more ossification centers, characterized by sequential degeneration or aseptic necrosis and recalcification. OCD lesions involve both bone and cartilage. These lesions differ from acute traumatic osteochondral fractures; however, they may manifest in a similar fashion. 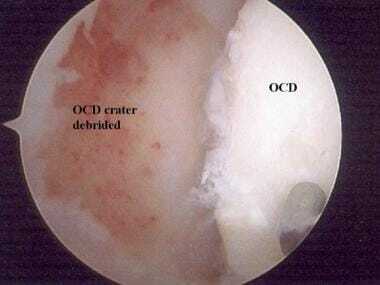 OCD lesions also must be differentiated from meniscal pathology. OCD causes 50% of loose bodies in the knee. The etiology of these lesions is multifactorial, including trauma, ischemia, abnormal ossification centers, genetic predisposition, or some combination of these factors. Little agreement exists among researchers regarding the etiology of OCD. Anteroposterior and lateral radiographs of medial femoral condyle osteochondritis dissecans. Anteroposterior radiograph of medial femoral condyle osteochondritis dissecans. Arthroscopic view of medial femoral condyle osteochondritis dissecans, hinged medially. Note the large size and thickness of the fragment. Arthroscopic view of osteochondritis dissecans of the medial femoral condyle. The osteochondral fragment has been elevated from the crater. Note the sclerotic crater with an interposed fibrocartilaginous layer. This lesion has been previously treated with drilling; an old drill hole can be seen faintly at the upper aspect of the crater. Arthroscopic debridement of the osteochondritis dissecans bed to bleeding bone. Replacement of the fragment and temporary Kirschner wire stabilization. Completed osteochondritis dissecans stabilization with 2 Herbert screws. On initial examination, the most lateral defect was comminuted and removed; the larger weight-bearing surface was maintained and stabilized. In 1558, Ambroïse Paré removed loose bodies from a knee joint. In 1870, Paget described quiet necrosis within the knee. In 1888, König coined the term "osteochondritis dissecans." He proposed this condition was caused by spontaneous necrosis due to trauma. Since the introduction of radiography, 50 additional anatomic sites within the body where OCD can occur have been identified. The average age at presentation is 10-20 years, but osteochondritis dissecans may occur in persons of any age group. The male-to-female ratio is 2-3:1. Bilateral involvement is noted in 30-40% of cases. In 85% of cases, lesions are observed on the medial femoral condyle (MFC) of the knee; 15% of cases are observed on the lateral femoral condyle. Of the MFC lesions, 70% occur in the posterolateral aspect. Of patients with OCD, 21-40% have some history of trauma. In skeletally immature patients, 150 cases per 250,000 people are reported. In skeletally immature female patients, 18 cases per 100,000 people are reported. In skeletally immature male patients, 29 cases per 100,000 people are reported. In skeletally immature individuals, the vascularity to epiphyseal bone is very good, supporting both osteogenesis and chondrogenesis. With disruption of the epiphyseal vessels, varying degrees and depth of necrosis occur, resulting in a cessation of growth to both osteocytes and chondrocytes. In turn, this pattern leads to nonspecific changes that produce disordered enchondral ossification, resulting in subchondral avascular necrosis or OCD. 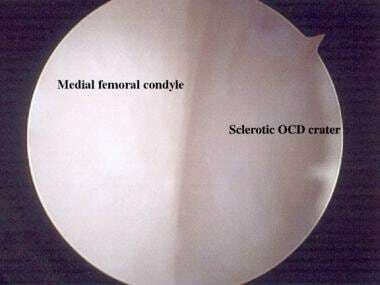 Four stages of OCD have been identified, including revascularization and formation of granulation tissue, osteoclasis of necrotic fragments, intertrabecular osteoid deposition, and remodeling of new bone. With delay in the revascularization stage, an osteochondritis dissecans lesion develops. OCD lesions may lead to articular-surface irregularities, which can cause degenerative arthritic changes. 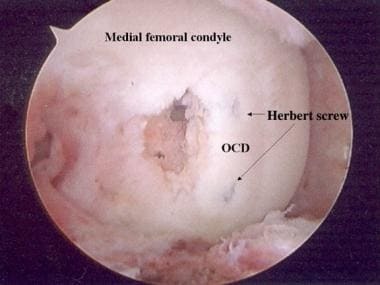 A proposed cause of OCD is an anatomic variation allowing the lateral aspect of the femoral condyle to abut the tibial spine, leading to repetitive localized epiphyseal microtrauma with osteochondral separation and subsequent OCD. This pattern may lead the patient to walk with the tibia externally rotated to avoid this abutment. Tabaddor RR, Banffy MB, Andersen JS, McFeely E, Ogunwole O, Micheli LJ, et al. Fixation of juvenile osteochondritis dissecans lesions of the knee using poly 96L/4D-lactide copolymer bioabsorbable implants. J Pediatr Orthop. 2010 Jan-Feb. 30(1):14-20. [Medline]. Pascual-Garrido C, Friel NA, Kirk SS, McNickle AG, Bach BR Jr, Bush-Joseph CA, et al. 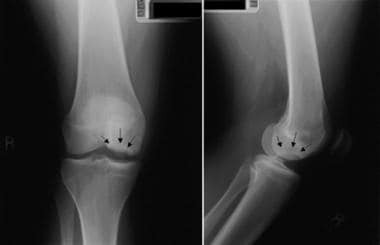 Midterm results of surgical treatment for adult osteochondritis dissecans of the knee. Am J Sports Med. 2009 Nov. 37 Suppl 1:125S-30S. [Medline]. Adachi N, Deie M, Nakamae A, Ishikawa M, Motoyama M, Ochi M. Functional and radiographic outcome of stable juvenile osteochondritis dissecans of the knee treated with retroarticular drilling without bone grafting. Arthroscopy. 2009 Feb. 25(2):145-52. [Medline]. Kijowski R, Blankenbaker DG, Shinki K, Fine JP, Graf BK, De Smet AA. Juvenile versus adult osteochondritis dissecans of the knee: appropriate MR imaging criteria for instability. Radiology. 2008 Aug. 248(2):571-8. [Medline]. Heywood CS, Benke MT, Brindle K, Fine KM. Correlation of magnetic resonance imaging to arthroscopic findings of stability in juvenile osteochondritis dissecans. Arthroscopy. 2011 Feb. 27(2):194-9. [Medline]. Camathias C, Festring JD, Gaston MS. Bioabsorbable lag screw fixation of knee osteochondritis dissecans in the skeletally immature. J Pediatr Orthop B. 2011 Mar. 20(2):74-80. [Medline]. Abouassaly M, Peterson D, Salci L, Farrokhyar F, D'Souza J, Bhandari M, et al. Surgical management of osteochondritis dissecans of the knee in the paediatric population: a systematic review addressing surgical techniques. Knee Surg Sports Traumatol Arthrosc. 2013 May 17. [Medline]. Schulz JF, Chambers HG. Juvenile osteochondritis dissecans of the knee: current concepts in diagnosis and management. Instr Course Lect. 2013. 62:455-67. [Medline]. Erickson BJ, Chalmers PN, Yanke AB, Cole BJ. 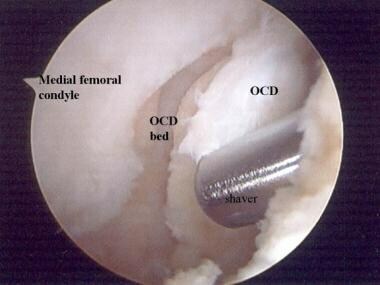 Surgical management of osteochondritis dissecans of the knee. Curr Rev Musculoskelet Med. 2013 Jun. 6(2):102-14. [Medline]. Krause M, Hapfelmeier A, Möller M, Amling M, Bohndorf K, Meenen NM. Healing predictors of stable juvenile osteochondritis dissecans knee lesions after 6 and 12 months of nonoperative treatment. Am J Sports Med. 2013 Oct. 41(10):2384-91. [Medline]. Nakayama H, Iseki T, Kambara S, Yoshiya S. Analysis of risk factors for poor prognosis in conservatively managed juvenile osteochondritis dissecans of the lateral femoral condyle. Knee. 2016 Dec. 23 (6):950-954. [Medline]. Andrews JR, Timmerman LA. Diagnostic and Operative Arthroscopy. Philadelphia, Pa: Harcourt Brace & Company; 1997. Beaty J. Orthopaedic Knowledge Update 6. Rosemont, Ill: American Academy of Orthopaedic Surgeons; 1999. 506-507. Browner BD. Skeletal Trauma: Fractures, Dislocations, Ligamentous Injuries. Philadelphia, Pa: WB Saunders Co; 1998. Siliski JM. Traumatic Disorders of the Knee. New York, NY: Springer-Verlag; 1994. Anteroposterior MRI of medial femoral condyle osteochondritis dissecans. Lateral MRI of osteochondritis dissecans. Herbert screw stabilization of medial femoral condyle osteochondritis dissecans. 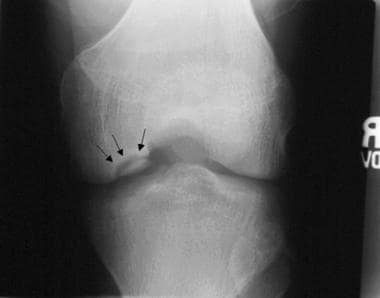 Lateral radiograph of osteochondritis dissecans. Anteroposterior MRI of medial femoral condyle osteochondritis dissecans, hinged medially. Orthobiologics: A New Era for Articular Cartilage Surgery?